There are three main types of lead flashing. Understanding the differences between them, can help you ensure the right one is specified and used on your projects. Types of lead flashing: The precise control of a lead rolling mill produces the highest quality lead flashing. Manufactured under a fully automated, computer controlled process, this produces lead of the highest quality and consistency. 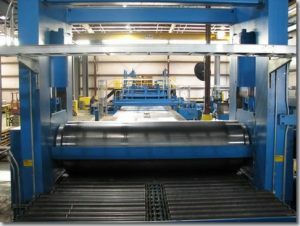 During production, a large lead ingot is repeatedly passed between two hydraulic rollers until a sheet of lead of an exact thickness and consistency is formed. 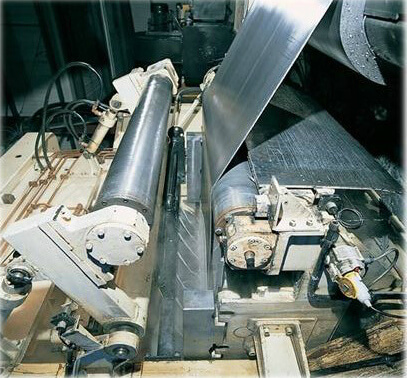 This production method ensures that each and every roll of lead will be of a similar thickness along the entire length of the roll. Because of the consistency from roll to roll, this is the preferred roof flashing material for many roofers, architects and contractors. Additionally, buildings being produced to high specification, may request the use of lead manufactured to BS EN 12588. Milled Lead is the only lead flashing that is produced to this standard. Most experienced roofers prefer using milled or rolled lead. There is common agreement that it is easier to work, less liable to split and less likely to contain the brown tint often found in cast lead. A cast lead roll being produced. Cast lead sheet is produced by rotating a half-submerged water-cooled drum in a bath of molten lead. As the drum rotates, the hot molten lead sticks to the side of the cold drum and solidifies. This is then peeled of the drum and onto a cutting bed. Unlike milled lead where the thickness is precisely controlled by the spacing between two rollers, the thickness of cast lead is controlled by varying the depth that the roller is immersed and the speed at which the drum rotates. This difference in production methods means that cast lead can never match the exact tolerance as that of milled or rolled lead. Users will often find that cast lead varies in thickness along the length of the roll. On high specification work this could cause the lead to buckle or split. Because it is produced with less intense production methods, cost can be slightly cheaper. However as most roofers and architects now insist on using Milled or Rolled Lead, this cost difference has significantly decreased over the last years, as the laws of supply and demand catch up. It is worth noting that many experienced roofers remark that it Cast Lead harder to work and easier to split. Often it contains a rusty / brownish tint that spoils the look of detailed lead-work. Produced by pouring molten lead onto a table of compressed sand, the liquid lead is quickly leveled by hand to the desired thickness. Sand Cast Lead’s unique dimpled surface (caused by rapid air cooling along the uppermost layer of the metal) is often specified by architects wanting to capture an age old character for their buildings. Because it is produced by hand, thickness along the length and the width can vary significantly. It is disliked by some roofers and contractors who require lead sheet produced to an exact thickness. Due to the high cost and low consistency of this production method, most sand cast lead is produced to special order, and in thicknesses of Code 6 (2.65mm) and above. As such it is typically desired by those re-building historic or heritage properties where materials must match those used on the original construction. Choosing the right types of lead flashing can help you deliver a better finish on your building. Ashbrook Roofing stock a wide range of milled lead flashing, much of which is available for next day delivery. Previous Previous post: Which is the best breathable roofing felt? Next Next post: 1F Felt: Roofers return to undertile felt.